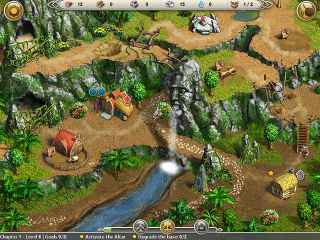 Free Download Viking Saga: Epic Adventure Game or Get Full Unlimited Game Version! Go on an epic adventure around the globe in the name of love! Visit 4 continents and test your skills by completing 40+ cleverly designed levels! 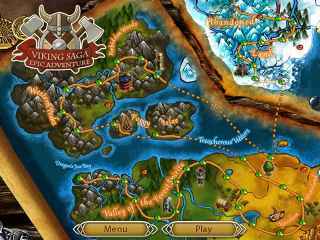 In order to get advantaged of playing Viking Saga: Epic Adventure full unlimiteg game version you must register the game. Go on an epic adventure around the globe in the name of love! In order to marry the woman he loves, Northern King Ingolf, must complete her father's request to find the biggest diamond in the world. The jewel is hidden in the faraway lands so you and the brave leader of the Vikings will have to embark on an epic journey across the land and sea. In your travels you will visit 4 continents, meet helpful friends and cunning foes. Play Epic Adventure today and enjoy 44 cleverly-designed levels that will test your resource-management skills! On the quest for the ultimate treasure, join Lily in her grandfatherâ€™s backyard as she digs for archeological fame and glory! Search the long lost ship, The Jangada. Undo the curse that plagues the ship and bring peace to Anna’s tormented soul.